Happy Canada Day. I'm working on finishing this Canada wallhanging 48 x 60. It's a fun pattern by Calgary designer Cheryl Atkinson. I hope the sun shines on you this weekend. There's only a few days to go before Canada Day. 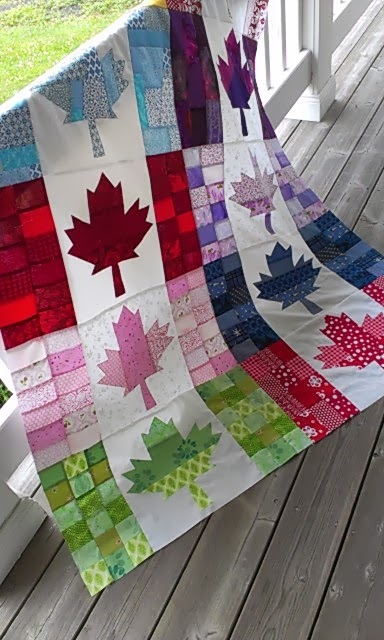 I've been wanting to make a Canada Day quilt for a few years. 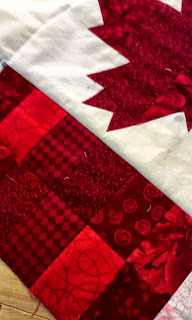 I'm not usually a last minute person, but last Thursday, I decided at that I would make a Canada Day quilt. With a little over a week to work at it, I'm dedicating a little time each day. 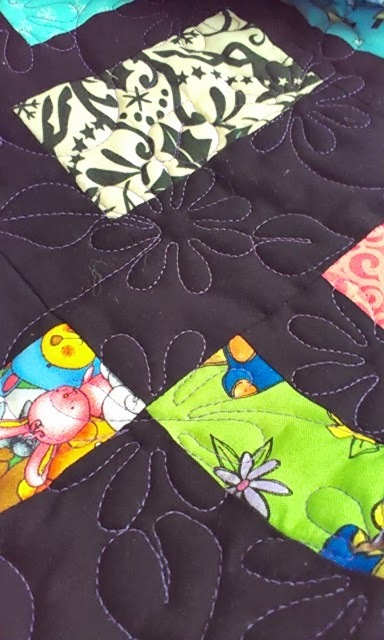 It's not a big quilt, and there's only 10 blocks. It's no surprise that a Canada day quilt will have red and white in it, but I think you will be surprised at what the whole quilt looks like. I'm hoping to have it machine quilted soon, but we'll see. I'll show you at least the top on Canada Day, July 1st. It's a Pfaff Passport sewing machine that is. My friend Lucy B. picked it up in Moncton yesterday when she picked up hers. Thanks Lucy!! 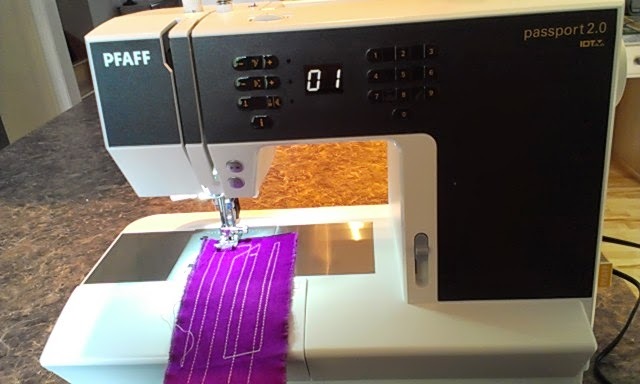 It's a lightweight sewing machine that is perfect for taking out to workshops, or when going away on extended trips, like I do once in a while. 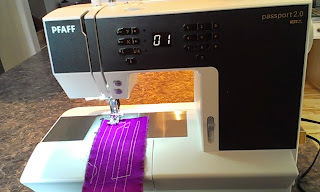 I've been considering buying a small machine for years, but nothing really found it's way here. Until now. Besides being lightweight, I like this machine because it has the IDT walking foot that I'm used to. It has bright LED lights that I'm not used to. It's awesome. This Passport uses all the same specialty feet that I use on my other Pfaffs. Those feet were a big investment over the years. It has needle down, which I couldn't live without. 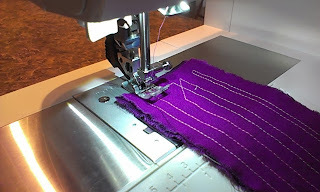 It has over 50 types of stitches and many that I don't have on my older Pfaffs. It comes with a great hard carrying case that has a special slot that you tuck the foot pedal and cord in. So easy to carry. And I love the price. It's on for $500. just until the end of June. So now, I need to take my new Passport and go somewhere and sew. Everyday, I use the free Milk Calendar on my wall to mark my appointments, and keep notes. I've been using this calendar every day for years. But I don't think I've made too many of the recipes. Yesterday, having a big bunch of rhubarb to use up, my husband said let's try the recipe displayed for the month of June. We had all the simple ingredients on hand. 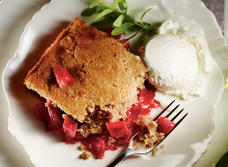 I have to tell you, it's the best rhubarb cobbler I've ever had. No sugar in these ingredients. It's perfectly sweetened with honey. So, before you turn the page on your Milk Calendar, give this one a try. It's lovely. If you don't have the Milk Calendar, the recipe can be found here. Got another 10 blocks done on my Veterans Quilt. I'm still on schedule. That's 20 blocks done out of 70. I got these 10 done at the cottage this weekend. I'm working on a special project, which is sort of last minute. So this weeks vet blocks will likely be done next weekend at the cottage too. I had a request to make two screen tote bags last week. So I rather than make just two, I made four. In the meantime, the other two are now spoken for. Now, I still have 4 more pieces of screen left. 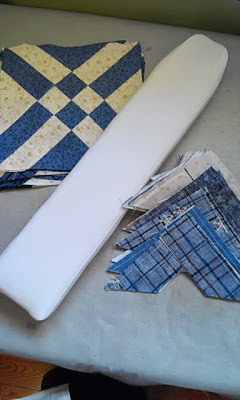 I had purchased big pieces of screen remnants last winter at Fabricville. I had enough for at least 10 bags or more. 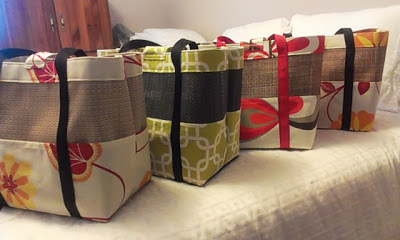 I'm on the hunt for a half metre of nice outdoor fabric to make the tops and side pocket and 3 yards of webbing for each bag. Then I'll be all set to sew the final four. It'll be a nice project over a couple of days later this summer when I have nothing to do. 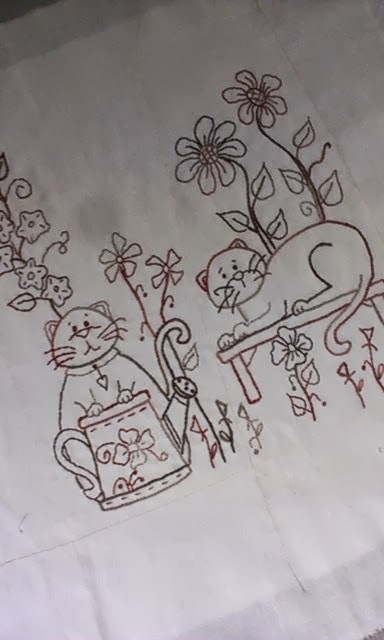 I hadn't stitched on my kittens project since getting back from Florida. 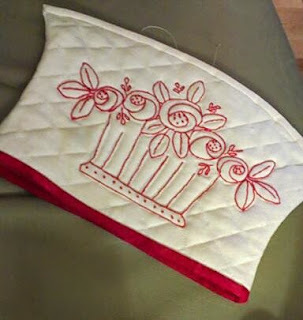 Now that all my urgent sewing is done, it's nice to slow down a bit and do some stitching. Aren't these kittens having fun sitting on the garden bench. 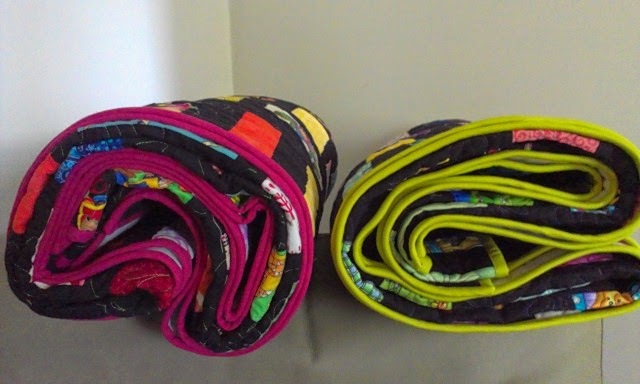 Summertime or not, look who's wrapped up and snuggling under their new quilts. Grace has the quilt with the pink binding, and Caitlin with the green binding. Sleep tight little ones. Veterans Quillt Blocks - 10 done. 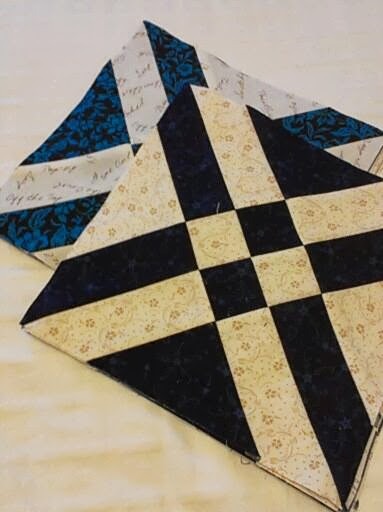 I'm doing 10 blocks a week on my quilt for the veterans quilt. Easy to do this week with the rain et all. 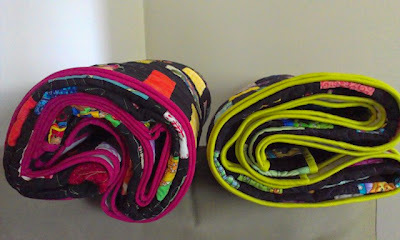 I have next weeks 10 blocks cut and ready to sew. It might get harder as the summer gets closer. The nice weather is so inviting, and besides, my sewing room is too warm to do too much machine work. I made myself a sleeve pressing board this week. My husband shopped the Home Depot for just the right piece of wood. He pointed one end slightly and rounded over all the edges. I covered with batting and cotton. I've used every day since I've made it. Just for small awkward things like inside bags, etc. So, they're bound and soon they will be bound for their new home. I wonder if they'll guess whose is whose. Caitlin and Grace's Quilts - Machine Quilted! I'm thrilled to get my two quilts back from Gwenda so soon. The machine quilting is gorgeous. 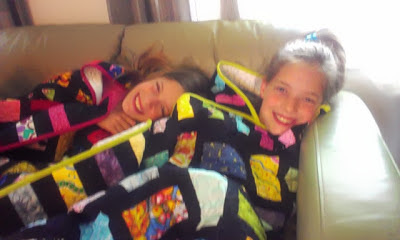 They are Caitlin's and Grace's quilts that we started last winter. The girls picked out the fabrics and the pattern. I left it up to Gwenda to pick out fun machine quilting designs for the each of the girls quilts. The only thing I wanted was for the design and thread color to be different on each quilt. And they are. Wonderful Choices. Daisies on one, and birds and butterflies on the other. 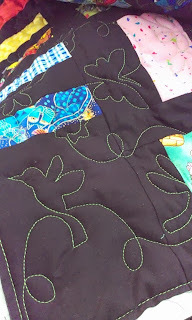 I won't show you the whole quilts right now because I want to get them bound and let kids to see them in person first. I'm excited for them to see them. Many thanks Gwenda for a speedy and perfect job. A group of five slippers. 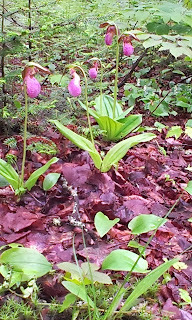 We counted 20 lady slipper blooms at the cottage this past weekend. It's fun to see how many we can find in our little patch of woods. 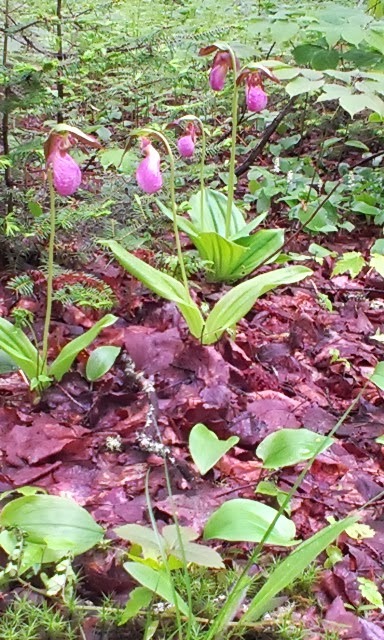 The lady slipper is PEI's provincial flower. 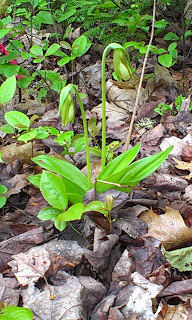 I wonder if they are having a comeback of the ladyslipper. For a while they were rare. Seems that we are doubling our blooms every year. I'm sure we have more, but on this day, it was damp and the bugs kept us moving. Lady slipper with white blooms. I hand stitched this little basket of flowers last year. It was a weekend project at the cottage. Well, this weekend, almost a year later, I turned it into a tea cozy. I added two layers of warm and natural batting and a muslin backing to this piece of linen. 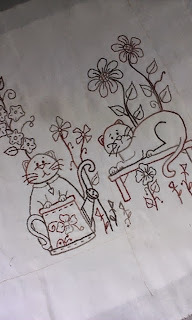 Then I machine quilted a grid and in and around the redwork. No particular pattern was used. I just made it to fit my favorite little Paderno teapot and it fits perfectly. I have a quiet week ahead, why don't you stop by for a cup of tea.